If you are wondering what you could do with some of the whole wheat wraps you have leftover from the delicious Chicken Veggie Wraps here is a delicious idea! Make these amazing lunch wraps! I made one with salmon and one with chicken! Just smear the cottage cheese on the wrap and season with some pepper. Put the cucumber slices and arugula on it followed by the salmon and wrap it up! Just smear the mayonnaise on the wrap followed by the salad. Put the slices of chicken on top, cut the cherry tomatoes in four and sprinkle over. Slice the egg, put it on and wrap it up! 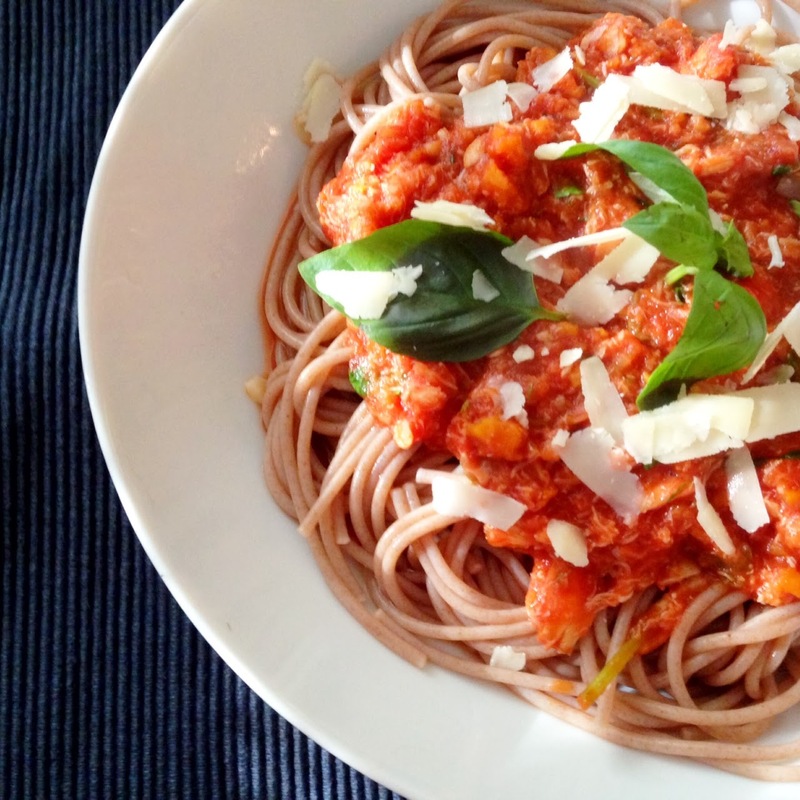 This crab bolognese pasta is a perfect variation to the classic pasta bolognese. Since I don't eat a lot of beef I already made a healthier version of pasta bolognese (see: Debbie's Pasta Bolognese) and this crab bolognese from Jamie Oliver is also a great healthy variation! Cut the carrot and spring onion into small pieces and put them together with the crushed garlic clove, fennel seeds, anchovy filets and basil stalks in your food processor. Chop the wispy, upper part of the fennel, keep the fennel bulbs (and foliage) separately, do the upper part with the rest of the ingredients in the food processor and chop everything finely. Put this mixture with one tablespoon of olive oil in a large (frying) pan and stir regularly for a couple of minutes. Grate the lemon zest over the vegetable mixture. Add the crabmeat and the passata and give it a good stir. Put the lit on the pan and leave it to simmer on low to medium heat. Optional (not in picture): Make a salad from the fennel bulb by chopping them in your food processor together with one crop little gem lettuce. Add some mint leaves, salt, pepper and lemon juice and finish it of with some parmesan cheese grater and extra virgin olive oil. Chop the basil leaves and add it to the sauce together with the juice of half the lemon. Drain the pasta and put it on your plate with the sauce on top. Add some fresh basil leaves and grated parmesan cheese and your dinner is ready! Oh my! These wraps are sooo goood! And as a bonus they are super easy to make and I just used some leftovers I found in the refrigerator! Perfect after a long working day and since I used leftover vegetables also relatively cheap! Slice the chicken into small cubes and bake them in 1 tbs olive oil and 1 crushed garlic clove in a frying pan on medium heat. Meanwhile, quickly chop your vegetables and after about 3 minutes when the chicken cubes are somewhat brown on each side add the mushrooms and onion. After another 3 minutes add the paprika and when the chicken is cooked and the mushrooms are done this part is finished. While you bake the chicken and veggies, put the pulp of the avocado in a small bowl and smash. Finely chop the tomato and add to the smashed avocado with a pinch of salt & pepper and the juice of half the lemon and you have guacamole without garlic. Heat your wraps in the microwave, then first smear the guacamole on the wrap, followed by some fresh (washed) spinach leaves. Then top it of with the chicken mixture. When I layer all the ingredients on my wrap I always make sure that on the bottom I have some space with no stuffing which makes it easier to fold and eat the wraps! Just fold the piece without filling up (inwards until it covers the stuffing a little bit), and then fold the sides inward and your wrap is ready to be eaten! Today I made the most delicious vegetarian sandwich! Perfect and full of vitamins to fight my upcoming cold! Also in the upper left corner a sneak peak of my do it yourself notebook project. My old notebook in which I keep my recipes was full so I went to the Hema and there I saw letter stamps! Oh my, that was something I had to have! Then I found a plain notebook which was perfect because now I could use my stamps to personalize my recipe idea notebook! Simply roast the slices of bread in your toaster. When they are done put the homemade red pesto on one side each. Then layer one slice with sliced tomato, arugula and sliced avocado and put the second slice of bread on top with the pesto facing down. Cut in half, put on your plate. Then put some arugula on your plate as well mixed with the sliced sundried tomatoes and mozzarella cubes. So it's time for another rice recipe and this time I have made a recipe by Jamie Oliver for a delicious Indian chicken curry way more simple! I personally think the tastes are just as great and actually the rice turns out better. In the original recipe Jamie first heated cardamom pods, cinnamon stick, bay leaves, clove and cumin seeds in a pan with olive oil until it starts to smell fantastic (and yes is does smell amazing!). The he added the rice and hot chicken stock and cooked the rice for about 20 minutes. But actually it doesn't sound like much but it took me quit some time and I needed a lot of extra ingredients making the dish more expensive. So in order to fit the dish to my lifestyle I made some changes and I will present the recipe to you! Cut the chicken into cubes of about 2 cm and finely chop the onion. Add some olive oil to a large non-stick pan on high heat. Brown the chicken chunks in the pan and transfer them to a plate when done while leaving the pan on the heat. Meanwhile crush 1 clove, 1 teaspoon of cuin seeds and 2 cardamom pods in a pestle and mortar until fairly fine. Add this to the pan when the chicken is out and cook for about a minute or so, stirring constantly until it smells amazing. Then add the chopped onion, reduce to a medium heat and cook for around 5 minutes, stirring occasionally, until the onion is soft and slightly golden. Meanwhile, peel 2 cm of fresh ginger and coarsely grate on a box grater and crush 2-3 garlic cloves. When the onion is done add this and cook for a minute more. Then add a good pinch of sea salt, 1/2 teaspoon ground turmeric and the tin of tomato cubes. Stir through the ground almonds. Then add the chicken and bring to a boil. reduce to simmer over a low heat and cook for 10-15 minutes, or until cooked through and tender. Add a splash of water if needed. Meanwhile, in a small frying pan on a medium heat, toast about 25 gr flaked almonds for a couple of minutes, tossing frequently or until lightly golden. If the chicken is cooked stir in 75 gr natural yoghurt and season with salt & pepper. You can also add some lemon juice to taste! Then it's time to plate up. First put halve of the rice on your plate followed by halve of the curry and on top the flaked almonds. If you want you can top it all of with some fresh coriander leaves. The remaining rice, curry and flakes can be put into a freezer box and when cooled down you can store it in the freezer. In the Netherlands it's almost 'Sinterklaas' (Sint Nicolaas) which means that at 5 december kids will get presents and till that time eat a lot of spice nuts ('pepernoten'), chocolate letters and chocolate milk. So I was looking to make a more healthy version for chocolate milk since I try to avoid eating and drinking too much dairy products. So I don't drink as much cow's milk as a year ago. I choose to incorporate alternatives for milk into my diet like almond milk and coconut milk. You can also try soy milk or rice milk but I prefer almond and coconut. I always make my morning oats with almond milk! But I always have loved chocolate milk, but the store bought ones contain too many unnecessary food additives and sugars. So how can you make your chocolate milk somewhat more healthy and enjoy it without feeling guilty? Well it's really easy! Sure it doesn't taste exactly the same but it's still good! Just poor in one cup of unsweetened almond milk. In a small bowl mix 1 tbs cocoa powder with 10 ml agave syrup, 1/4 ts vanilla extract and 1 tbs of water until it's a chocolate syrup. Add 1 tbs of this syrup to the milk, heat it for 1 minute and 30 seconds in your microwave and it's done! I was really craving fish tonight so I decided to make Jamie's Tuna Salsa Verde! Tuna is rich in Omega-3 fatty acids which makes it perfect for dinner because these are the healthy fats! For the salsa, put the mint leaves and parsley in your food processor with the juice of half a lemon. Add the garlic clove, anchovy fillets, capers, extra virgin olive oil, mustard and white wine vinegar. Chop finely until it's somewhat smooth. Season with salt & pepper, dilute with 1 tablespoon of water and put aside. Remove the seeds from the paprika. Cut the tomato and paprika into pieces and put them in a bowl with the arugula. Rub the tuna steaks with pepper, salt, oregano and fennel seeds. Sprinkle over 1/2 tablespoon of olive oil each side and grill them for about 1 and a half minute each side. The tuna steak needs to be pink on the inside. Drain the water from the pasta and make sure you save 1/2 cup of cooking water. Mix the pasta with the tomato mixture and about halve of the salsa. If you want you can add some cooking water to make it somewhat more creamy. Put it on a plate. 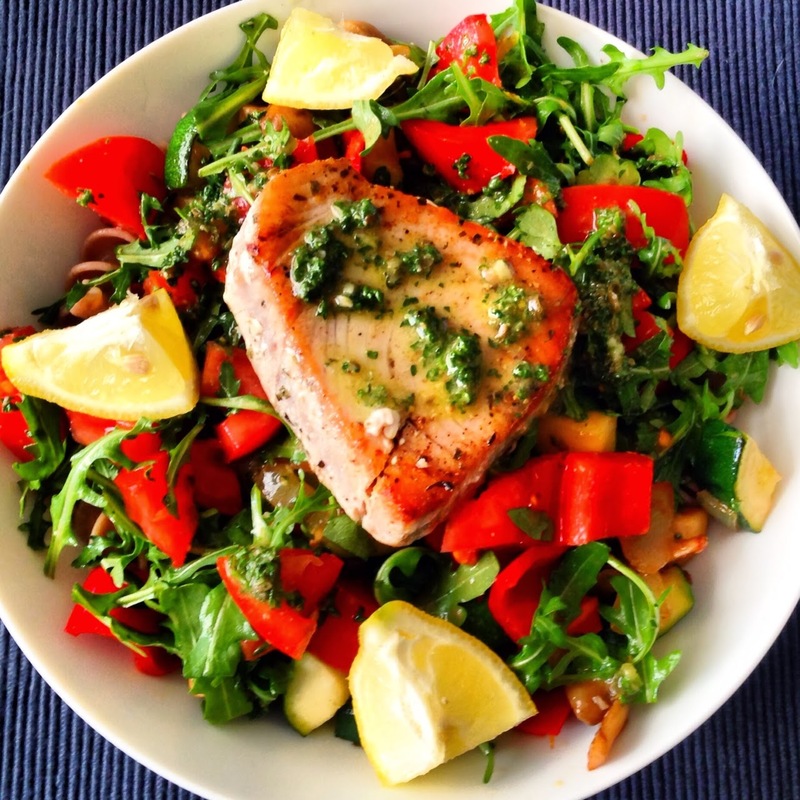 Put the tuna steak on top with the extra salsa and serve with some lemon parts on the side. If you want to stick to a budget (Clean Eating on a Budget) you need to know which fruits and vegetables are in season. Because if they are, their price will be lower because they are grown in your own country and there is plenty of each item! For some products there will not be a high difference in price but every cent helps! Also the tastes will be better if they are in season! In this post I will focus on the fruit that are in season in which month in the Netherlands. If you live in America I found a handy site of Field to Plate. This shows which fruits and vegetables are in season per month in each state! If you have any other sources for other countries please do share in the comments! I have made a chart for you which shows in one instant which fruits are in season in which month in the Netherlands. If you have any additions to this table please leave it in a comment so I can update it!